I have received many compliments from our golfing Members with regard to the current conditions of the golf course followed by the same question; "Why are we renovating?" The standard answer provided is that the course was scheduled to be renovated in 2020, but due to the overwhelming response of the membership vote in 2014 regarding the Master Plan, the renovation was accelerated to 2015. From an agronomic point of view, we know that there are substantial issues under the surface of turf grass with regard to drainage, the overall elevation of the greens, inconsistencies within the bunkers, and degrading cart path surfaces that need to be corrected. The golf course renovation is fast approaching with construction starting on Monday, April 13. The course will remain closed until mid-November so please plan accordingly. The contract has been signed with Landirr Inc, our construction company who has been in business for 30 years. They have performed all facets of golf course construction from irrigation and drainage work; bunker renovations; greens building; complete golf course renovation and new construction. Most notably, they have performed all of the construction work at The Villages in Central Florida where they are based. The Villages consists of over 600 golf holes ranging from Executive courses to Championship courses including designs from Nancy Lopez and Arnold Palmer. Kipp Schulties, our golf course Architect, is excited to work with Landirr Inc. and to make the necessary corrections to our golf course and provide some new challenges for all golfing members to enjoy. Primarily, our greens will be elevated by over 12 to 18 inches and our bunkers will be redesigned to improve both form and function. An exciting change from both a playability and maintenance perspective is the elimination of all Coquina cart paths. Recently, Kipp was on property marking several trees scheduled to be relocated throughout the property. These trees have been tagged with orange ribbon and will have their roots pruned in February to prepare them for relocating in April. Many trees will be relocated between Holes 4 and 5 and between Holes 16 and 17 to provide improved separation between the Holes and protection to golfers. It will be important to get these trees in position early to ensure a successful transplant and develop a root system before Hurricane season commences in June. Stakes will be used to secure the trees in place. The week of March 16 is when the herbicide, Round Up, will be applied to all turf grass areas. A repeat application will be made 2 weeks later to ensure successful control of the existing turf grass. Spot treatments of Round Up will be applied throughout the construction period before the planting of the Celebration Bermuda grass. The application of Round Up will have a dramatic effect on the green turf grass we are currently enjoying by turning it straw brown. Once the golf course is closed on April 13, and the grass has been eliminated, our usual summer practices of scalping the grass, verti-cutting and aerification will begin. These practices are completed to remove excess thatch and provide a suitable bed for the Celebration to make contact with the soil. It is critical to have this sprig to soil contact, similar to planting a seed. to ensure successful germination of the new grass. Fortunately, the golf course irrigation system will remain operational throughout the project and will help to keep dust to a minimum. 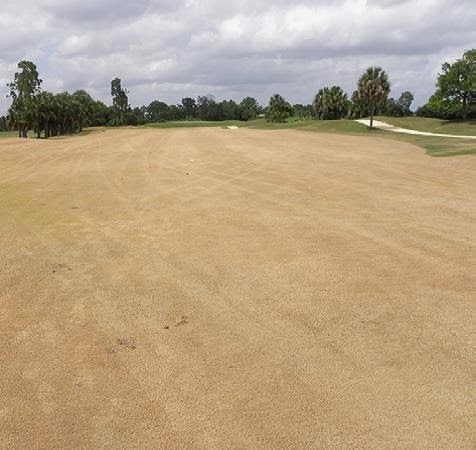 Members should expect to be impacted by debris similar to what is experienced every summer during our cultural practices such as aerification, verti-cutting and vacuuming of the turf grass. As always, it is suggested to remove outdoor furniture for the summer due to the threat of Hurricanes and to have your pool filter inspected weekly for contamination from debris.